Curtis Mayfield was one of the dominant figures of soul music for three decades. From his breakthrough in the early sixties with The Impressions, through his ground breaking solo work in the seventies to his more mature songs in the eighties he remained a hugely influential figure. The accident that paralysed him in 1990 deprived everyone of any new work from then until his death in 1999 but his music has continued to inspire artists from across the musical spectrum. 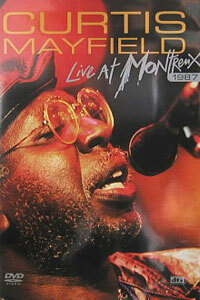 This performance, filmed at the Montreux Jazz Festival on July 18, 1987, finds Curtis on fine form. His distinctive falsetto vocals are in evidence on a tracklisting that spans his career from early Impressions hits such as Gypsy Woman and Its All Right through to his solo classics including Move On Up, Freddies Dead (theme from Superfly), If Theres A Hell Below, Were All Going To Go and People Get Ready.